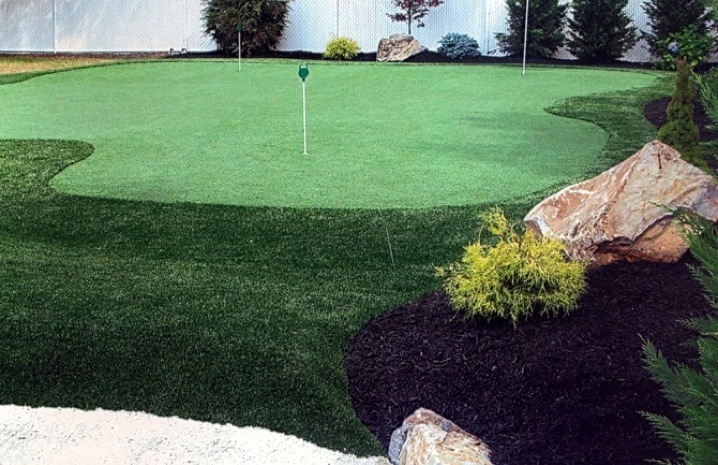 Custom Putting Greens are maintenance free, weather resistant golf greens that can fill the void in your practice schedule by providing a 24 hour practice facility to enjoy in the comfort and privacy of your own home. 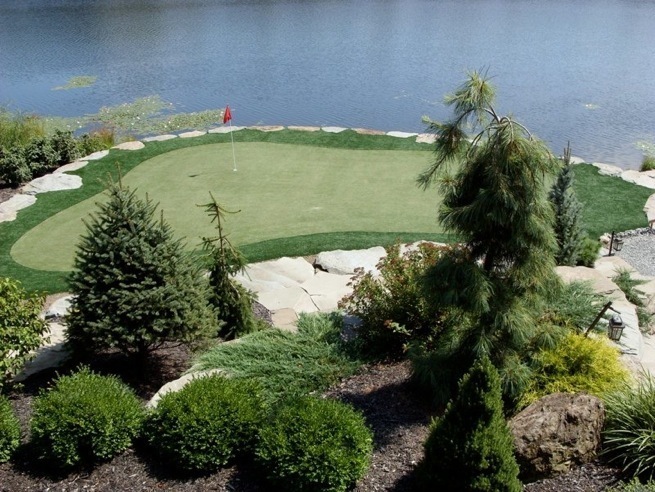 Our professional synthetic turf putting greens can be installed anywhere a golfer might want to practice and can match any landscape environment. ​spin characteristics and club grabbing ability you would find on a country club fairway. can achieve it - ​the only limit is your imagination. We start by excavating and compacting the site. Then we add a two layer compacted crushed stone flex-base. We shape and contour to your specifications. Next we place the turf and add a special blend of cleaned and size graded rounded quartz silica. We then broom the quartz silica into the turf with a specialized power broom. This causes the fibers to stand upright, relax and blossom. Finally we apply a combination of black and green top-dressing sand, which gives the green a realistic appearance. Our last step is to adjust the speed of the green by rolling it. The yarns are an advanced generation of polypropylene fibers with a dual tufted polyurethane backing. It resists all forms of rot, mildew and bacteria. It will not degrade due to standing or flowing water and resists chemicals and heat. How much will a Custom Putting Green cost? 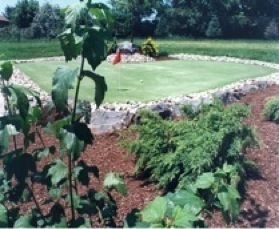 Custom Putting Green generally cost between $12.50 and $18.50 per square foot. The prices vary based on size and other site-specific factors. Other factors include the accessibility of the site to our equipment and materials, the need for significant grading and sodding, and the addition of retaining walls or other landscaping. Green prices for residential applications typically run between $3,500 and $20,000. Of course, placing a Custom Putting Green in your yard will create a beautiful landscape with both a fun and functional use -- a smart investment! The materials used in our Custom Putting Greens are made from tough polypropylene fibers and are designed to resist the harmful effects of rain, snow, ice, and sun. With proper and regular maintenance (once or twice a year), your green can last as long as 20 years or more. At what speeds do the Custom Putting Greens roll? Our greens can be installed to roll at any speed desired by the client. The speeds can be adjusted at any time just by brushing or rolling the green. Most greens are set based on the client’s wishes somewhere between 8 to 12 on the “Stimpmeter”. How long will it take to install a Custom Putting Greens? Most greens can be installed in less than a week, depending on the amount of site preparation and clean up required. You might be putting and chipping the weekend after we start! 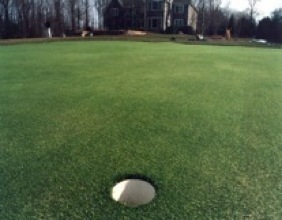 What kind of maintenance is required with a Custom Putting Green? An occasional brooming and rolling is all that’s necessary to maintain its beauty and playability. Keep your green free of debris. Brush to revitalize fibers as needed. Roll with a water-filled lawn roller as desired to increase speed and smoothness. Once the initial installation is completed, just 2 or 3 hours per year is all that is required. We also offer an annual maintenance and tune-up program for our customers. Can you install lawns or athletic fields? Yes, we can install similar systems to be used for soccer fields, tennis courts, playgrounds, lawns, and tennis and basketball courts.